Hello, Accent Wall — this incredible photo collection turns a corner in the master bedroom to a statement piece, and a great reading nook, surrounded with great memories. The same flooring from the main living areas is continued through to the bedroom and makes perfect neutral yet warm, living balance to the black & white decor. 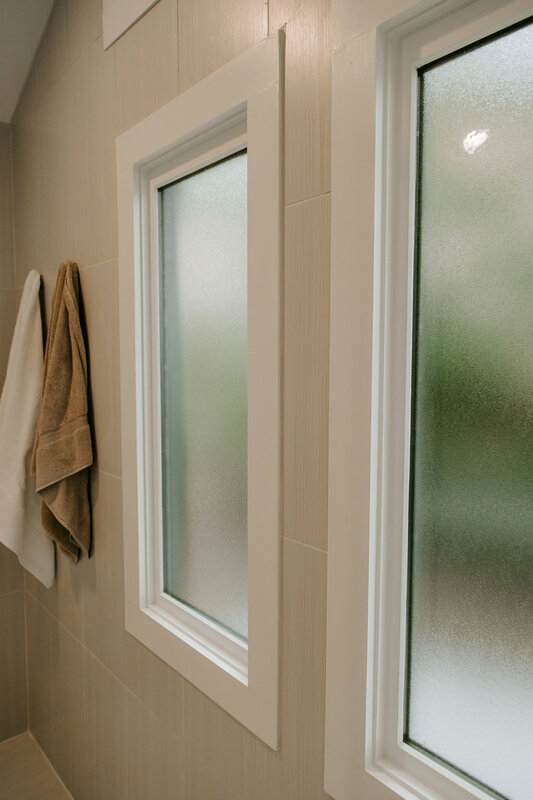 A unique window offers plenty of daylight and maintains privacy, and gives a unique view, including a peak at the hydrangea nodding in the breeze. Mimicking the narrow rectangle of the window, the gas fireplace insert is the REAL showstopper in this bedroom. Cozy and entrancing! The configuration also expanded the closets, a his and hers on either side of the hallway leading to the bathroom. The theme of neutral bright spaces, a relaxing oasis from the hustle and bustle of the work of the rest of the house, continues in the bathroom. 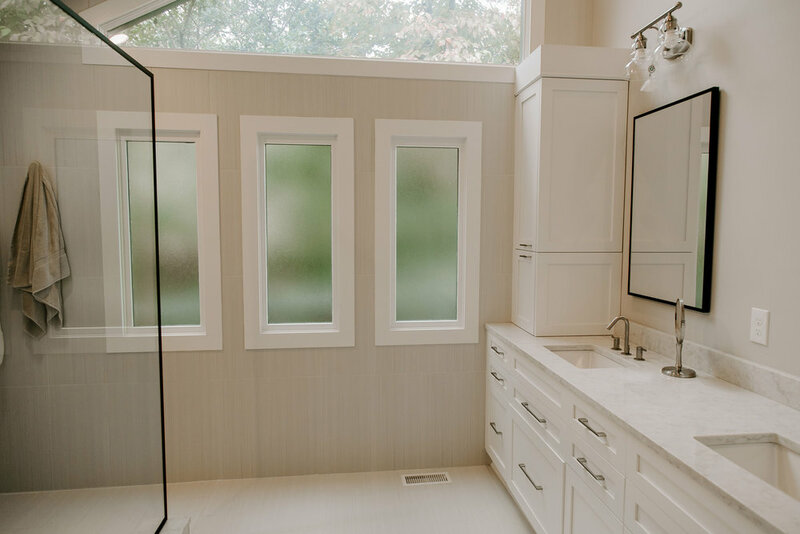 Favorite features: the zero-entry shower featuring floor to wall tiling, a triad of privacy windows, and the cathedral ceiling. 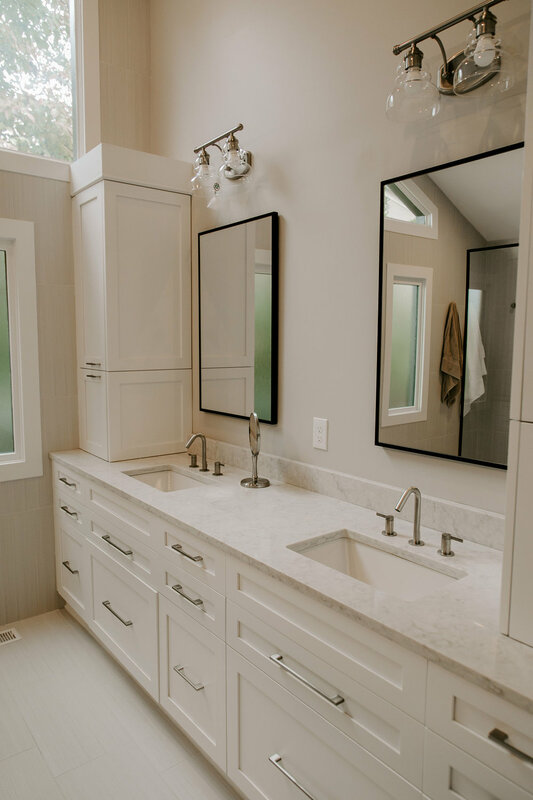 The double vanity with an all drawer base is topped with a quartz, undermount sinks and sleek stainless steel fixtures. This home was a fascinating study in creativity applied to an original footprint, without being committed to keeping even one room the same! Our clients and the BAC team embraced the value of #lovewhereyoulive and thought outside the box to craft this eclectic, modern farmhouse. Let us know if we can help you love where you live!